ESP Today is an open access journal, which means that all content is freely available without charge to the user or his/her institution. 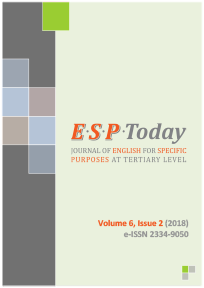 Users are allowed to read, download, copy, distribute, print, search, or link to the full texts of the articles in ESP Today without asking prior permission from the publisher or the author. This is in accordance with the BOAI definition of open access. We firmly believe that scientific research should be published in an open access format, so that everyone interested may freely read and re-use that information without any financial or technical barriers, providing the authors are properly quoted, cited and acknowledged. No fee is charged for publication in ESP Today.